Our youngest was given an assignment by her school teacher to write a paragraph about Hereditary Traits and/or Character Traits that have been passed on to her. She came home not knowing what to write about because writing about inheriting straight brown hair from your mom does not make much of a paragraph! I looked at her and said, "Did you know that you are a 4th generation artist?" She asked me what I meant and I went on to tell about how her great-grandfather was a oil/acrylic/watercolour painter and woodcarver (as well as other things), her PaPa has been a oil painter and a sign painter as well as a woodcarver along with other creative pursuits, her mom is a watercolour/acrylic painter and illustrator, and that she too is a watercolour/acrylic painter and constant doodler and sketcher! That's four generations of creativity and to add to that her PaPa married a very talented lady ("MomMom") who was a pastel artist and now paints regularly in acrylics! Well, if only you could have seen her as she sat up a little straighter - you could tell how special she felt as she realized that an ability to draw and paint came from so far back in her family line and is now residing in her!! God has definitely blessed her! 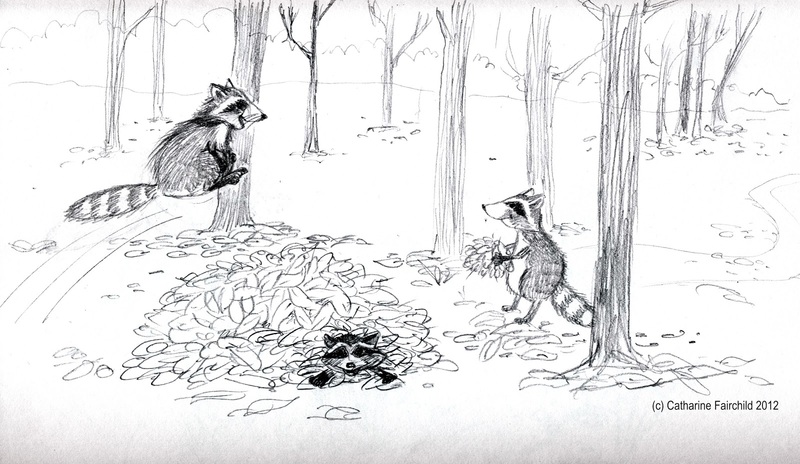 Recently I suggested she draw a raccoon jumping into a pile of leaves - really leaping - right into a BIG pile of leaves. It's one of her favourite activities so I thought she could have fun with it... her hold up was that she didn't know how to draw a raccoon but I encouraged her to try her best and think about how they have a big round body, striped tail and black mask... I love what she came up with! I especially love the raccoon squealing, "Weeeeeeee!" in mid-air!! 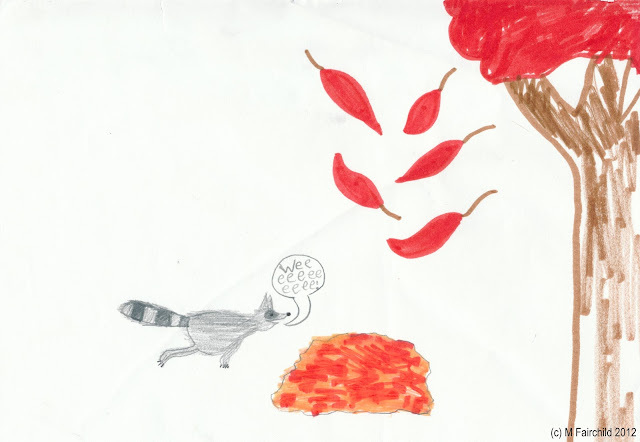 "Raccoon Leaping Into Leaf Pile"
Hopefully I pass on other important character traits to my children as God blesses me with time and ability. I hope you are all inspired to nuture lovely things you see in your children and encourage them to be proud of the talents and abilities God has blessed them with!! Kittens and Mittens and Yarn, Oh My!